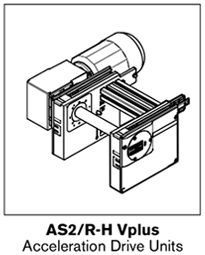 Unlike traditional power and free roller chain (GT2/R), accelerating roller chain (Vplus) allows for workpiece pallets to reach a conveying speed that is 2.5 times higher than the nominal chain speed. 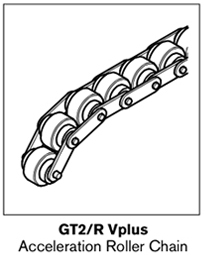 As a result, a lower chain speed can be selected, which results in low- noise operation and reduced wear. An- other key advantage is the accelerating effect that allows the workpiece pallet to reach a faster return to conveying speed after a processing station or after being released from a stop gate. How it works. 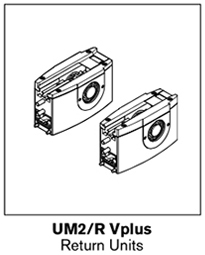 Vplus roller chain is constructed of two different size rollers that are attached to a common shaft. The large center (support) roller supports the wokpiece pallet, while the two smaller (transport) rollers provide the sliding friction. 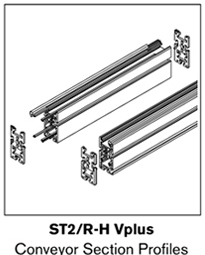 When loaded, the transport roller is driven by the supporting rollers via sliding friction. 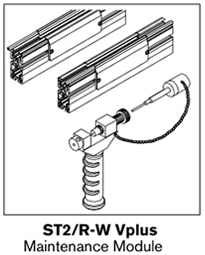 Due to the difference in size between the transport and support rollers, the workpiece pallet travels at a conveying speed up to 2.5 times faster than the nominal chain speed. Once the workpiece pallet stops, the support roller comes to a standstill and the supporting rollers continue to move freely via sliding friction. 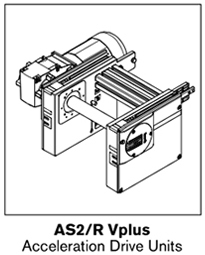 Due to the unique design characteristics of the chain, specially adapted drive modules, return modules, conveyor sections, and maintenance sections are required for use with the Vplus chain.